The body requires iodine for proper functioning and prevention of serious health conditions, so iodine-rich foods should be included in your daily diet. Consumption of fish, vegetables, and iodine-rich fruits may boost your immune system, mental stability, and overall good health. Knowing how to balance levels to prevent an iodine deficiency, as well as how to eat more iodine-rich foods in your daily diet while avoiding excessive amounts is very important. What is iodine? It is a trace mineral found in many foods and is key to the production of essential hormones by the thyroid gland. It is used and required by our organs, tissues, muscles, and all internal systems. Iodine also converts food into energy. Why You Should Eat Iodine-Rich Foods? Iodine is essential for the proper functioning of the thyroid gland and subsequently the functioning of vital organs, bone and central nervous system development, and hormone production. Insufficient amounts of iodine may result in hypothyroidism and hyperthyroidism, which can both lead to an enlarged thyroid or a goiter. Hypothyroidism may lead to concentration troubles, weight gain, extreme fatigue, muscle spasms, and dry skin. Consuming iodine-rich foods for hypothyroidism can regulate these and other body changes. Low levels of iodine also stimulate fluctuations in energy, weight, mood, metabolism, appetite, and core body temperatures. Long before a baby is born, its development relies on proper nutrition of the mother. Having an iodine-deficient diet may lead to birth defects, such as slowed growth and poor brain development. This may result in learning disabilities and motor-function issues. A sufficient amount of iodine may be required for healthy brain development as well as intellectual capabilities. A study published in 1994 in the official journal of the American Thyroid Association, Thyroid, looks at how a deficiency of the trace mineral may lead to many irreversible mental disorders. Core body temperature may experience extreme fluctuations with low iodine levels. The thyroid requires iodine to regulate body temperature, like when sweating, for example. This also allows controlled detoxifying of wastes through our pores and saliva production. Iodine-rich foods may help to produce sweat and prevent dry mouth, which without iodine, can lead to digestive problems and loss of appetite. Iodine supports detoxification of metals collecting in the body such as mercury, cadmium, and lead through the urine. The body is exposed to toxic chemicals daily, such as chlorine, fluorine, and bromine. These are found in the water and food we consume, as well as in the household products we use. A buildup of these chemicals may lead to thyroid problems and result in serious health conditions. Good iodine levels may help to prevent the thinning or loss of hair as the mineral boosts hair growth. Iodine supports the health of the teeth by supporting the endocrine system. An iodine deficiency may lead to tooth decay, gum disease, and eventually tooth loss, as it may trigger extreme dry mouth conditions. The skin holds more than 20% of the iodine in the body. An iodine deficiency may lead to dry skin and impair the proper functioning of sweat glands. Related Articles: Does Thyroid Disease Cause Hair Loss? The reproductive health and fertility of both men and women may be improved and supported by consuming iodine-rich foods. Iodine aids in reproductive system development and supports the growth of sexual organs. An iodine-enriched diet supports the immune system by regulating proper functioning of the thyroid gland, which controls the metabolic rate and fights bacterial or viral microorganisms. The muscles contain 32% of stored iodine to assist in proper muscle function. An iodine deficiency may affect the muscles with severe pain along with the symptoms of fatigue, mood swings, and insomnia. As iodine supports the immune system and destroys harmful cells, its antioxidant property may help prevent the growth of cancer cells. Iodine deficiencies are linked with thyroid cancer, colorectal cancer, prostate cancer, ovarian cancer, and endometrial cancer. It is important to consume iodine-rich foods to maintain sufficient levels in the body. The U.S. Food and Drug Administration has set parameters for iodine daily values based on gender, as well as certain health conditions and lifestyle. Those with alternative food choices should consume vegetarian foods rich in iodine. While most adults should have an iodine intake of approximately 150 micrograms (mcg) daily, there is no requirement for food manufacturers to include the iodine content on food labels. However, food products that are specifically fortified with iodine will list the percentage on the label. The ocean provides some of the best iodine-rich foods, with kelp having four times the recommended daily amount in just one tablespoon at 2,000 mcg. Other iodine-rich foods from the sea to include in your diet are one tablespoon of each of arame (730 mcg), hiziki (780 mcg), and wakame (80 mcg). Also, a one-inch portion of kombu offers 1,450 mcg of iodine. Aside from kelp, other members of the seaweed family also offer some of the highest contents of iodine. 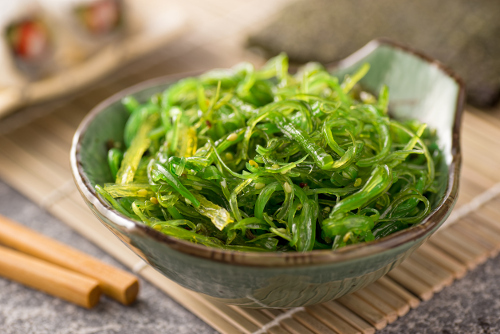 Most seaweed offers 4,500 mcg of iodine in only a quarter of the serving. This pushes the total percentage beyond the daily recommendation by more than 3,000%. Cranberries are antioxidant-enriched fruits that are rich in iodine. Organic berries offer 400 mcg of iodine in just four ounces, which you can also consume in juice form. Enjoy more than one-half of the recommended daily amount of iodine in one cup of organic plain yogurt. This natural form of probiotics offers 90 mcg of iodine. Organic navy beans are considered as one of the top bean varieties for iodine. In addition to the high-fiber content, navy beans have 32 mcg of iodine in a half cup serving. Gain 10% of the recommended daily amount of iodine with one cup of organic strawberries. Fresh strawberries offer 13 mcg of iodine. Raw organic cheddar cheese offers 10 to 15 mcg of iodine, along with a high content of calcium, protein, and essential B vitamins. Also, goat’s milk cheese offers the same benefits and may be better for digestion. Organic potatoes are one of the best vegetable sources of iodine with 60 mcg in one medium-sized potato. Leave the skin on to get the best iodine benefits. Table salt and iodine-containing salts such as iodized salt may be the main source of iodine in a daily diet. A total of 77 mcg are found in one gram of iodized salt. In addition to offering essential minerals, calcium, and vitamin D, milk is a good source of iodine. It offers 56 mcg in one cup. Milk products such as frozen yogurt, ice cream, and cheese are also great iodine sources. As a member of the ocean, cod gains iodine from the seawater environment. Eating three ounces gives 99 mcg of iodine, which is 99% of the daily value. It also provides essential omega-3 fatty acids, vitamins, and minerals. Another seawater-edible creature, shrimp can provide 35 mcg of iodine in a three-ounce serving. This is one-quarter of the daily value needed. Tuna is packed with essential vitamins and minerals such vitamin D and iron. In canned form, tuna offers 17 mcg of iodine in a three-ounce serving size to cover 11% of the daily value. Also known as gray salt, Himalayan salt is the better choice over table salt as it does not have the added chemicals. More than 150% of the daily value of iodine can be found in half a gram for 250 mcg. Moderate consumption of dried prunes is recommended daily for most diets. Five dried prunes offer 13 mcg of iodine as well as vitamins, minerals, and fiber. Gain nine percent of the daily value amount of iodine with one hard-boiled egg. With its contents of calcium, zinc, protein, antioxidants, and vitamins A and E, an egg offers 12 mcg of iodine. One medium-sized banana provides 3 mcg of iodine in addition to the high levels of potassium required for energy. The iodine content equals two percent of the daily value. Canned corn has 14 mcg of iodine in a half-cup serving. This brings the daily value to nine percent. With its high carbohydrate content, white bread should only be consumed in moderation. It does, however, offer 45 mcg of iodine in two slices, which is 30% of the daily value. Obtain 23% of the daily value of iodine in three ounces of turkey breast. In addition to a surplus of vitamins and other minerals, it has 34 mcg of iodine. Only a small amount of iodine is required for overall good health. And, the body cannot properly store excessive amounts of iodine. Adults usually only need to have up to 150 mcg a day. This equals to one-millionth of a gram. When adding iodine to the diet, there are several guidelines to consider in terms of sufficient intake amounts. The recommended amounts depend on age and certain conditions, such as pregnancy or nursing activity. An iodine deficiency may occur due to not consuming sufficient amounts of iodine. This is commonly seen parts of the world such as sub-Saharan Africa and South Asia. It is also a rising problem in Europe and the United States. This type of deficiency may lead to severe issues with digestion, immune system and thyroid function, and fetus development. Rare but extreme cases of iodine deficiency may be linked to miscarriages. During pregnancy, low iodine levels may cause the baby to have cretinism, a thyroid hormone deficiency at birth. This may lead to deafness, improper physical growth, and malfunction of the thyroid gland, as well as cause the muscles to continuously contract (spasticity). As previously mentioned, monitoring your iodine levels is important to maintain proper health. While low iodine levels are usually not a common issue for most people, a deficiency can cause problems during pregnancy and with fetal brain development. The body requires some amount of iodine to produce thyroxine and triiodothyronine (T3 and T4 hormones). Thyroxine is produced by the thyroid gland to assist in proper heart, digestive, and metabolic function. It is also vital for brain development, muscle control, and good bone health. Triiodothyronine is an active form of thyroxine created within the liver and kidneys. The thyroid gland also produces a small amount of triiodothyronine to enter the bloodstream. In most cases, the thyroid may not be significantly affected by having too much iodine. However, an excess of iodine becomes a concern when an overactive thyroid causes the production of excess hormones. Too much iodine can also cause the thyroid to decrease hormone production. Whether the thyroid has overactive or underactive hormone production, it may lead to the formation of a goiter. This enlarged thyroid may cause strained breathing episodes and coughing. Too much iodine may cause excessive saliva production along with a brass taste in the mouth. A rash may develop, and there could be digestive problems. Iodine is mostly stored in the thyroid, and unneeded amounts are expelled through urine. Excessive amounts of iodine in the body is unusual but can occur with diets high in seafood or seaweed. Using iodine supplements can also cause excessively large amounts. Consume organic iodine-rich foods like fruits and vegetables. Wash foods to remove any added chemicals and pesticides. Drink pure filtered water rather than aerated drinks. Use chemical-free personal care products. Do not eat or drink from plastic containers. Most body systems require an essential amount of iodine intake for proper functioning and stability. A deficiency may lead to issues with the thyroid, immune system, digestion, and reproductive system. It can also possibly lead to cancer. It is important to monitor and regulate the amount of iodine intake, as both low and excessive amounts can lead these serious health conditions. An enlarged thyroid, weight gain, muscle pain and weakness, and extreme fatigue are some of the signs to watch for with dangerously low levels of iodine. Iodine-rich foods can be easily incorporated into your daily diet routines as the trace mineral is found in many food sources suitable for all diets, including vegetarian and vegan. “Iodine. Fact Sheet for Consumers,” National Institutes of Health, February 17, 2016; https://ods.od.nih.gov/factsheets/Iodine-Consumer/, last accessed September 14, 2017. Delange, F., “The disorders induced by iodine deficiency,” Thyroid, February 4, 2009; 4(1): 107-128. DOI: 10.1089/thy.1994.4.107, last accessed September 15, 2017. “Iodine. Fact Sheet for Health Professionals,” National Institutes of Health; https://ods.od.nih.gov/factsheets/Iodine-HealthProfessional/#en2, last accessed September 14, 2017. “What is Thyroxine?” Hormone Health Network; http://www.hormone.org/hormones-and-health/hormones/thyroxine, last accessed September 14, 2017. “Goiter,” Mayo Clinic, November 9, 2016; http://www.mayoclinic.org/diseases-conditions/goiter/home/ovc-20264589, last accessed September 14, 2017. “Iodine in food and iodine requirements,” Food Standards Australia New Zealand, June 2016; http://www.foodstandards.gov.au/consumer/nutrition/iodinefood/Pages/default.aspx, last accessed September 14, 2017. Johnson, L.E., “Iodine,” Merck Manual; http://www.merckmanuals.com/en-ca/home/disorders-of-nutrition/minerals/iodine, last accessed September 14, 2017.